It seemed the perfect book to accompany my morning commute. After all, that’s the time when I am most preoccupied with coffee: I can smell it thanks to my fellow commuters, I can imagine its robust flavors, and I anticipate that moment when I can hold the coffee cup in my hand and feel its comforting warmth (I generally wait until I’m at work before I have my coffee). I crave it. When you drink coffee, there is often a process to consumption. And it may be different for everyone, but we all have our methods. I add my sugar and cream—I realize I probably lose points for not taking it black, but it’s my coffee and I’ll have it my way, thankyouverymuch—and I watch the cream swirl along the top. I take a tentative sip, testing the flavors and the temperature, teasing my senses further. I hold the cup in both hands and allow my entire body to anticipate the caffeine … Okay, perhaps I’ve told you too much, but you know you have your own rituals. If all you do if pick up the cup and down the contents, you aren’t a coffee drinker. There are many different ways of reading philosophy books. Sometimes you need to gallop through them Napoleonically … But sometimes you want to work through systematically from the first page to the last, taking notes as you go … And sometimes you want to browse through with no clear sense of direction, seeing what your eye ends up alighting on, seeing what new thoughts are provoked (159). Grounds for Debate lent itself exceptionally to the latter experience: Though there were discussions that I poured over, leaving the pages riddled with notes and commentary of my own, I meandered my way through. No more integral to the social scene than the furniture, you are replaceable by any other patron. The non-place of the chain-store coffeehouse thus allows us to be non-persons, in a sense. We are private right out in public, and our devices facilitate this self-containment and public erasure—cell phones, smart phones, laptops, iPods allow us to engage in a social world that is happening elsewhere. It would seem we have better places to “be” than where we are—online, for example (104). There is a coffeehouse “community” that arises: you frequent the same place, the Baristas come to know your name (and possibly your order), you sit in the same place, and see the same people. But you aren’t required to perform any particular role in this space, and what’s more, you could visit any space like it, and find that this is essentially the case. The coffee house becomes a space where we can hide from work, or bring work with us and work on our own terms, where we can sit and watch, and occupy our time and thoughts with whatever pleases us. It is a public space, with no form or function attached to it other than coffee consumption. Coffee goes to work, whether in a steel-handled thermos to the construction site or in a paper cup from McDonald’s to the drone’s cubicle or in the ubiquitous cardboard-sleeved Starbuck’s cup to, well, any job at all (101). Coffee drinking often involves urgency and hurry—leaving stains on our clothes and papers, spills in the car—desperation and loneliness (102). Grounds for Debate is a fantastic read—providing insights into the coffee culture that even a tea drinker can appreciate. The collection encourages readers to consider their relationship to larger social practices that have resounding effects on daily life. 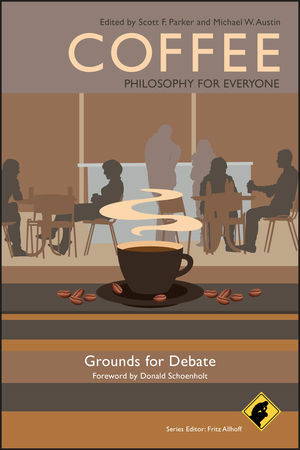 Note: Coffee—Philosophy for Everyone: Grounds for Debate was provided by the publisher for review. My friends and I recently lost our favorite coffee shop. You see, I'm a relatively new coffee drinker. I barely ever touched the stuff until about five years ago. but I've long been enamored of the concept of the coffee house. When I moved tot he DC area, I set out to find a good coffee shop for "hanging out". With some significant help, my friends and I found a pleasant, local place. Interestingly enough, the presence of couches was a key factor. Over the course of the last few years, this evolved into running a social group, with regular meetings - once a month at a coffeehouse, once a month at a member's home. This leads me to some curious places. You see, I've found it's uncommon - but not "rare", if you grok the difference - to casually speak with strangers, even at a coffeehouse, although that environment is one in which it seems less likely to result in offense. But this means that to synthesize the boisterous, active conversation with which coffeehouses are associated, one must bring the group. Ironically, this betokens that any coffeehouse into which we settle will be unsuccessful. As we bring a not-inconsequential number of people, we want someplace large but not heavily trafficked - in other words, a coffeehouse which is failing to do much business. A successful business is usually at, or close to, capacity, something we're avoiding. I'm told that the founders of Starbucks have long been frustrated: they sought to recreate the neighborhood coffeehouse, but the successful business model was that of a fast-paced coffee dispensary. Interestingly, according to tea advocates, the qualities I desire in coffeehouses are qualities engendered by tea. In fact, most of the tea documentaries I've seen and books I've read tend to cast coffee and tea as antagonists, while emphasizing the differences. Tea, it seems, is associated with quiet contemplation and tranquility, whereas coffee is associated with stimulation and frenetic energy. My own experience has been that these are strictly cultural; the two beverages could easily swap places. 9$/cup!!!???? Where the HELL did that cup come from? I've ordered a 16oz. coffee in New York and it wasn't over $2.75! Please tell me that is a pure over exaggeration on your part, and not a corruption of the book where the authors equate corporation branding for the actual drink of coffee, a Salted Caramel Mocha is not a coffee, it's an angle on corporate branding. I really hope that the authors did not succumb to 'corporate culture', if so that will diminish the book for me. Thanks for the review and the website.